Anping Top Wire Mesh Fence Factory was built in 1992, located in the "hometown of wire mesh"of Anping,acrossing from the well-known International Wire Mesh Exhibition Center.In order to meet the long-term business strategy, Anping Top Wire Mesh Fence Factory will set up a sales company in Anping, Hebei Province.The company will be registered as Anping Top wire mesh products co,ltd. The factory further commitment to drawing, pickling, galvanizing, packaging, transport One-stop production and processing services for sale. Through years of development, Anping. The plant long-term commitment to welding, molding, spray, to install one-stop production and processing sales Service, take advantage of years of development, and now owns 2,880,000 yuan of fixed assets, more than 58 employees, all types of technical personnel and 18, at a variety of welding machine, a single point, automatic welding machine network of steel, large-scale network break-chip Jin Su sets of bending machines and other equipment, has formed a specialized scale, the larger capacity production line. The main production company of the famous "SUN" series license barrier welding, metal column. Product categories include 2, more than 20 varieties of products are mainly used for airport guard-rails, field isolation network, storage network isolation, prison isolation network, traffic barrier, the stadium fence, garden fence, barrier area, highway guard rails, railway barrier , Fence construction, petroleum, coal, chemical industry, construction, textile, medicine, aviation, aerospace, railway highway, landscape protection, water, slope protection, fisheries, aquaculture, metallurgy and machinery exports, and other fields. Barrier with an annual output of 900,000 square meters, the completion of the production value of 9,800,000 yuan for the large number of domestic and foreign distributors and customers with a comprehensive security services. 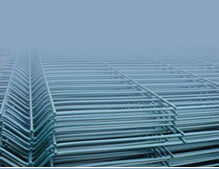 The main products: general welded fence,curvy welded fence, Euro fence,double loop decorative fence, chain link fence, ornamental fence,barbed wire,Razor barbed wire fence,Protecting Fence,garden fence,fencing posts,clips or accessories,grassland fence,temporary fence,hook spend fence, the stadium fence, Airport fence, the field isolation network, storage network segregation, isolation prison network, traffic barrier, road barrier, railway barrier, anti - Pry barrier, peach-column,and other networks. There used to highway guard rails, railways, airports, ports, urban construction, aquaculture protective net; for parks, lawns, hotels, casinos, wholesale markets, supermarket shelves, the decorations, and other handicrafts network; for housing development , Such as road construction, and other networks. Its products are corrosion-resistant, anti-aging, acid, do not fade, formed on the surface, bright, comfortable feel, and other advantages. Can be customized according to their own R & D technology barrier and the other column, or drawings based on customer requirements or OEM to develop the way. Our company adhere to the management idea of “quality of the first, the supremacy of the credibility” in accordance with customer demand for production. A source of the goods is with the lowest price.with a strong local logistics systems, product can be safely and quickly served. Anping Top Wire Mesh Fence Factory gain the customers’s trust and satisfactory with the most favorable prices and the quickest way.Company’s focus will be on developping himself into one of largester manufacturers and suppliers not just in China,but in Asia. Manager Zhao is willing to welcome friends from various social sectors to visit his factory and sincerely hope that cooperate with you for mutual benefit in order to make up a gold wire mesh road together for common development.